This is the story of Pocahontas, a brave Disney princess and nature lover, but the film is the first to be based on a real historic character: Pocahontas is daughter of Chief Powhatan who instilled the love of trees and animals, respecting all living beings on the planet. The chief Powhatan thinks that the happiness of his daughter will be married to Kocoum, a brave warrior. But Pocahontas did not want that. One day, the Susan Constant sails to the New World from England, carrying British settlers and Captain John Smith; John departs to explore and encounters Pocahontas. 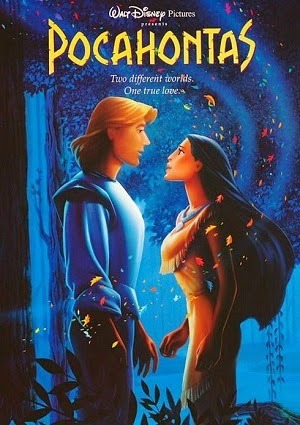 They quickly bond, fascinated by each other’s worlds and fall in love, flouting Chief Powhatan’s orders. But problems arise when you start a fight between the British soldiers against the people of the tribe of Pocahontas in order to steal the gold instead. The tribesmen come and capture John, then when Pocahontas must fight to try and rescue the love and calls the people do not judge her love for who apparently is the enemy. A furious Chief Powhatan declares war on the crewmen, starting with executing John. What will be the fate of these characters? Is the war stronger than love?